With 10:13 left in game tied 13-13 and neither team giving the other much momentum, the Bulls were in a tough spot against conference foe ECU. At this point in the game, Jordan Cronkrite was averaging just less than four yards-per-carry. He didn’t have the luxury of a rotation with USF’s other backs. Elijah Mack, Duran Bell Jr. and Trevon Sands were all out with injuries Saturday night. It wasn’t long after the ball snapped that Cronkrite and everyone in Raymond James Stadium knew that the score was about to change. 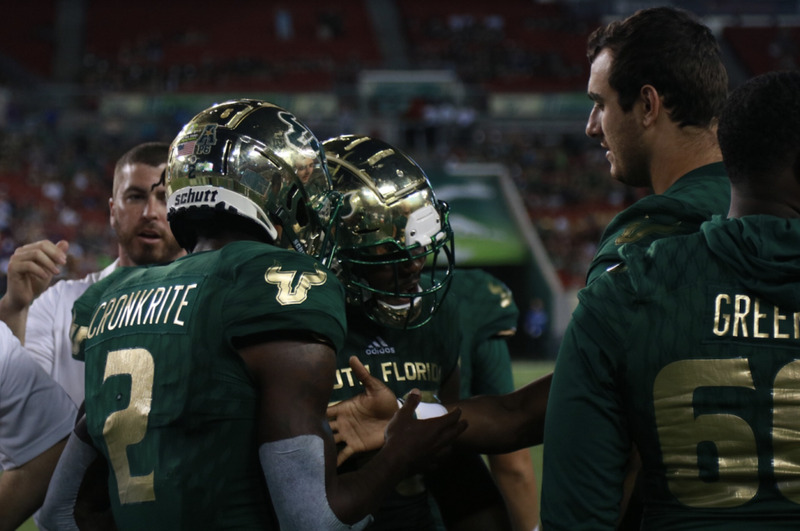 The struggling USF offensive line that allowed six sacks and seven tackles-for-loss opened up a hole in the middle of the field. Cronkrite found it and it was an 80-yard dash to the end zone in front of a roaring crowd. Cronkrite’s run in the fourth quarter was the last time either team would score and propelled the Bulls to a 20-13 win over the Pirates. Barnett was frustrated after the game. He took brutal hits on some sacks including one where an ECU defender almost ripped Barnett’s helmet off. Barnett knew there was room for improvement from the whole team. Barnett set himself up for a rushing touchdown when he connected on a 39-yard pass to Johnny Ford. At the beginning of the second quarter, Barnett found Darnell Salomon on a 66-yard touchdown pass. Another bright spot for USF was punter Trent Schneider. The Australian native punted nine times with a 49.2-yard average. 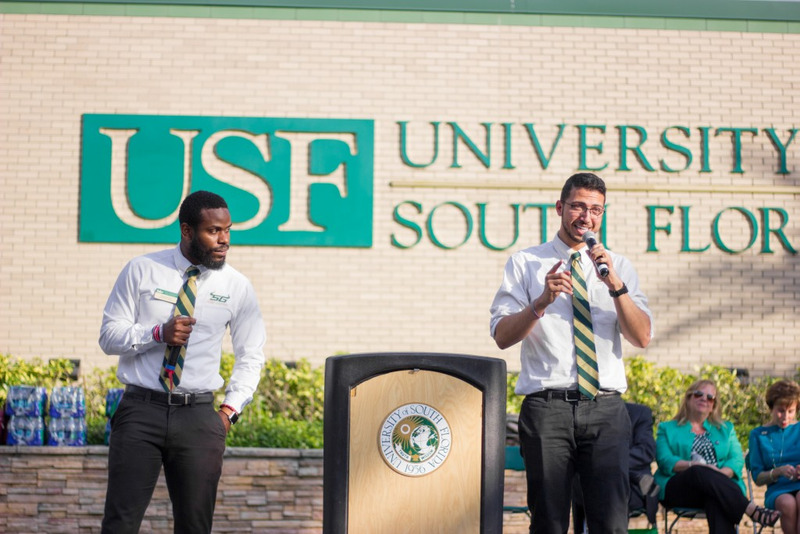 He tied a USF record for longest punt with a 72-yarder. Of his nine punts, Schneider placed six of them inside the ECU 30-yard line. The Pirates were struggling for field position for most of their drives. On defense, the Bulls held ECU to just three scores — two field goals and a touchdown. The Pirates’ lone touchdown came after a 47-yard pass to Trevon Brown. ECU quickly punched in a two-yard run right after. Bulls cornerback Mike Hampton was tasked with covering ECU’s Brown, who was targeted 15 times by his quarterback Reid Herring — the next receiver had 10 passes thrown his way. Despite Brown’s chances, he only caught six passes. Cronkrite’s run did more than just reclaim the lead for USF. The defense stepped up after the 80-yard run even though they played an outstanding game, according to ECU coach Scottie Montgomery. Redshirt freshman Nick Roberts recorded the Bulls’ only turnover of the game with an interception on ECU’s final drive. Taking the ball away from the Pirates with two minutes left to play sealed the victory for USF. At the end of the day, however, it was Cronkrite’s run — the game’s longest play from scrimmage — that gave the Bulls an edge to win. Barnett and Cronkrite both knew the big run would come eventually. After chipping away at the ECU defense, it was only a matter of time until a hole broke open.